I spent most of yesterday at Product Camp London, hosted at the expectedly trendy offices of The Guardian. 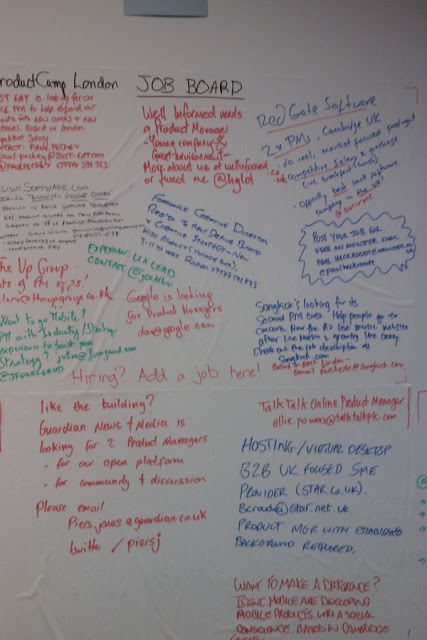 Product Camp is an unconference focussing on product management and marketing. For those not familiar with the format, an unconference is a participant-generated conference where those attending the conference sign up to give the talks. 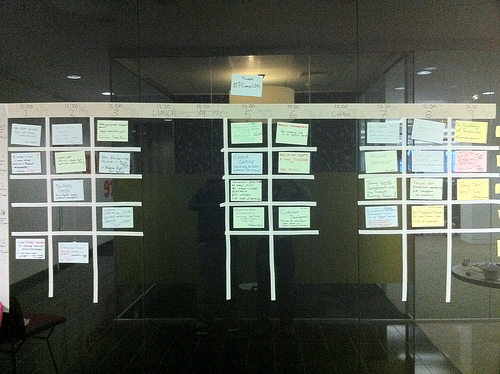 These can be organised in various ways, but Product Camp took a simple approach with a blank timetable on the wall with around 4 streams and 9 timeslots where people stuck post-it notes with sessions they wanted to run. The product focus is predominantly on software and web based products (at least nobody I spoke to was building a dual cyclone vacuum cleaner in their shed), and the skew seemed to tend towards the startup end of the market rather than more established companies. It's great to see these kind of community organised events in London, and judging by the adhoc job-board which sprung up, there's strong demand for good product people which is hopefully a good indicator of tech company growth. Customer Development. A quick overview of the classic Steve Blank startup philosophy given by Salim Virani of Lean Camp fame along with some group discussion about how it could it be applied in practice. Product Pricing. A talk by Paul Lomax of Dennis Publishing looking at ways in which pricing tactics like decoy prices and bundling can change consumer buying behaviour. Had there been more time it would have been useful to take a quick look at some of the underlying mirco-economic principles like consumer surplus and price discrimination, but it was a good talk with some great input from the audience. This one ended up winning the prize for the best session of the day. Psychology of Persuasion. Covering the basics of various persuasive techniques that can be used in marketing products (reciprocity, social proof etc). Some overlap with the pricing talk, but I guess that can't be avoided in an unconference. As with most of these events, many of the interesting discussions happened outside the main sessions, in the coffee breaks, lunch and the Google-sponsored drinks afterwards. The format worked well, and hosting it on a Saturday ensured a certain level of self-selection regarding interest in product management and marketing. Overall a great event and a great job by the organizers in pulling this together.